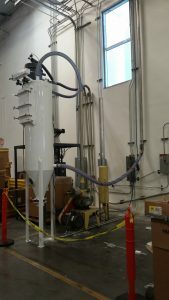 Do You Need an Inline Filter? The Inline Filter (ILF) is designed to fully protect the vacuum loader in powder convey systems. Even though a secondary cartridge filter is used, the cartridge filter clean and creates a cost saving on energy. The ILF also filters the dust when the primary receiver filter(s) break, preventing the repair costs and unnecessary downtime caused by a damaged blower. The product falls into the discharge cone, allowing the material to enter into the customer’s process. After time the deposited dust must be removed from the cartridge walls. This is done through a quick pulse of compressed air traveling through a venturi to produce a shockwave which knocks the dust from the cartridge wall. 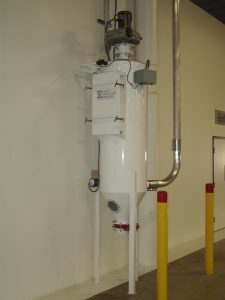 Standard construction for an inline filter body consists of a heavy-duty carbon steel welded body, tool free 22” x 40” hinged maintenance door, exhaust vent, and AEF white exterior. Cartridge cleaning is accomplished through an auto sequence reverse pulse timer housed in a NEMA-4 blow down enclosure. Cartridge condition can easily be monitored using the included pressure differential indicator.